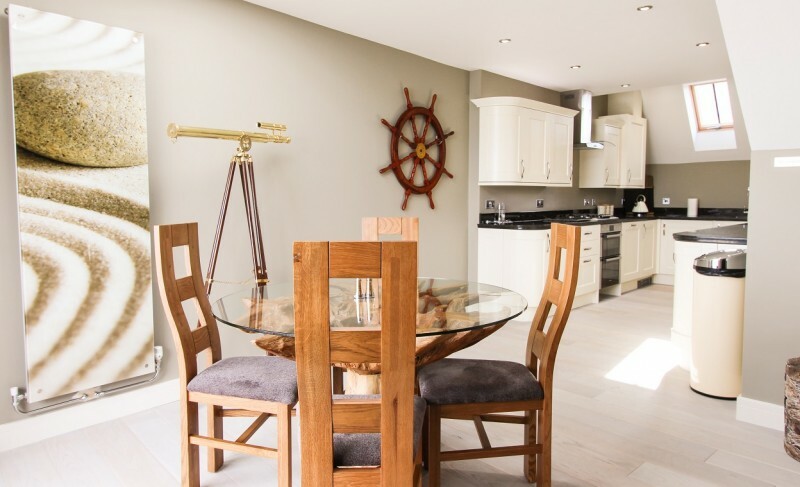 The Seagulls Sanctuary is a truly stunning, luxury apartment with extensive panoramic views across Wells channel, beach and out to Sea, sitting right on The Quayside in sought after, bustling seaside town of Wells-next-the-Sea. 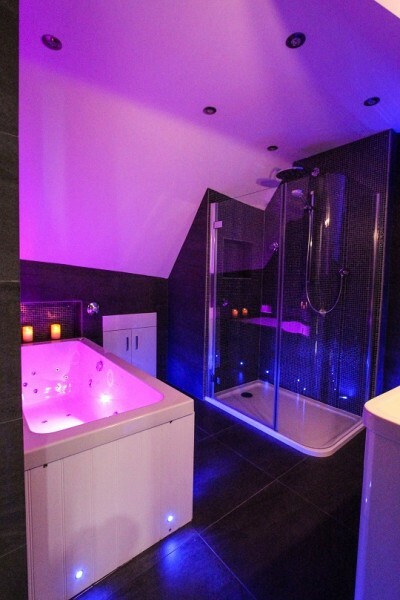 This wonderful property has been finished to the highest of standards and features many special features such as a Sonos wireless music system with speakers in every room running of an in house iPad with Spotify, a stunning mood bathroom with a large Jacuzzi bath and multi colored LED lighting, and large LED SMART T.V’s in both bedrooms and sitting room all with Netflix accounts. 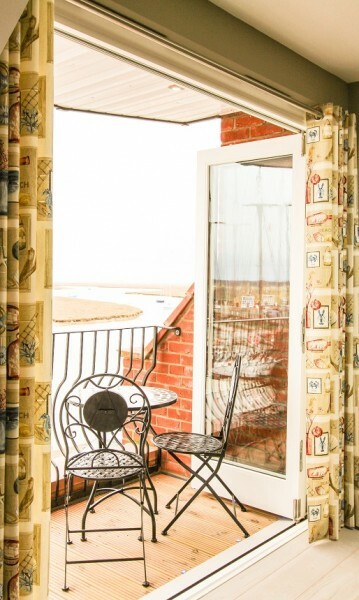 The entrance to The Seagulls Sanctuary is on the West Quay in Wells-next-the-Sea opposite the famous Albatros, a permanently moored 18th century schooner which runs as a CAMRA award winning bar, restaurant and live folk and blues music venue (we highly recommenced the savory Dutch Pancakes). 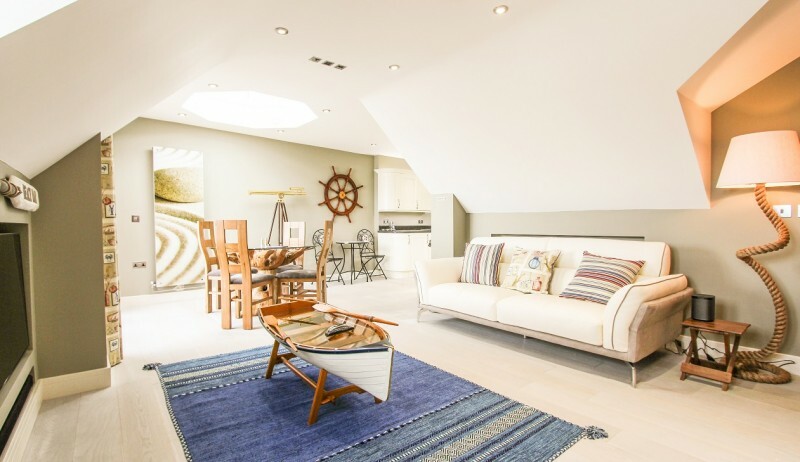 This fabulous second floor apartment has its own private oak staircase leading up from its entrance off a first floor entrance hall. 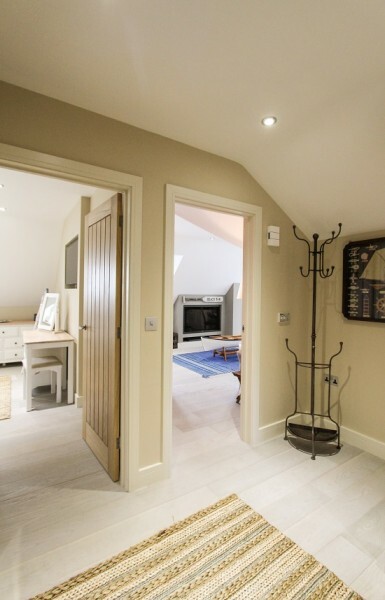 All of the rooms in the apartment are off a good sized hallway which has a large storage stand for coats and hats, there is lots of room to store boots and shoes under the oak staircase. 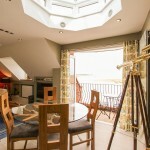 The main living space of The Seagulls Sanctuary is a lovely large, light and bright open plan space. 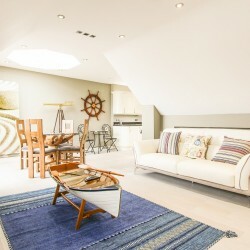 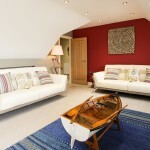 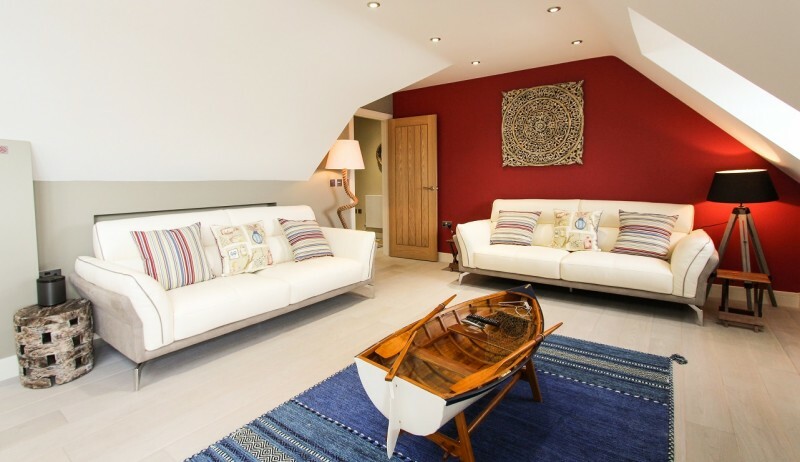 The sitting area is decorated in a seaside theme and has two large, stylish, comfy leather sofas arranged around the quirky ‘row boat’ coffee table and large Samsung LED SMART T.V. 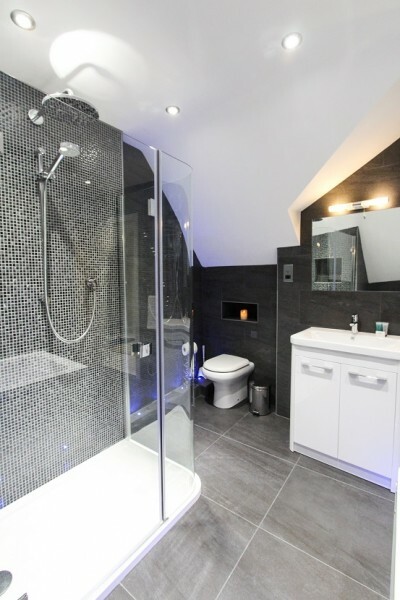 with sound-bar. 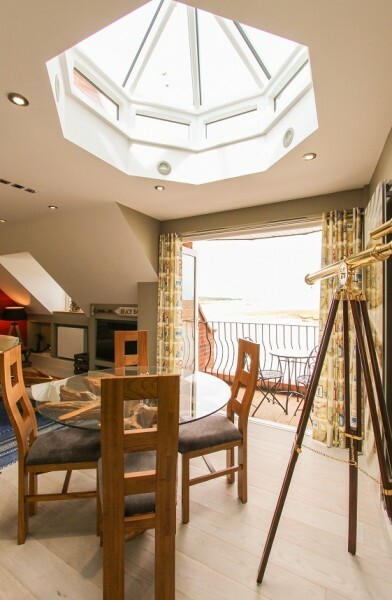 The fantastic ‘tree trunk’ glass top dining table seats four and sits below an up-lit glazed lantern roof and in front of the bi-fold doors that leads out on to the decked balcony. 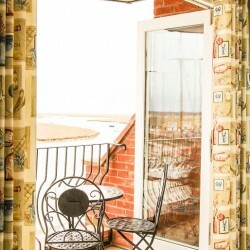 This balcony is a wonderful feature of the apartment and has wonderful panoramic views out to sea, across Wells channel and it famous sandy beach. 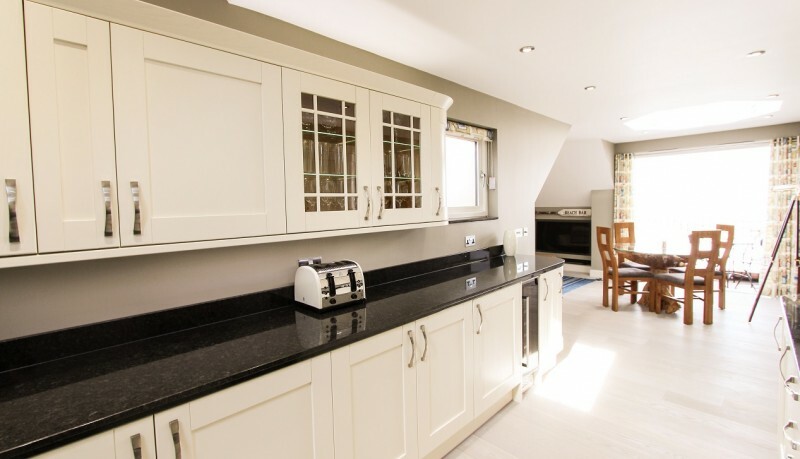 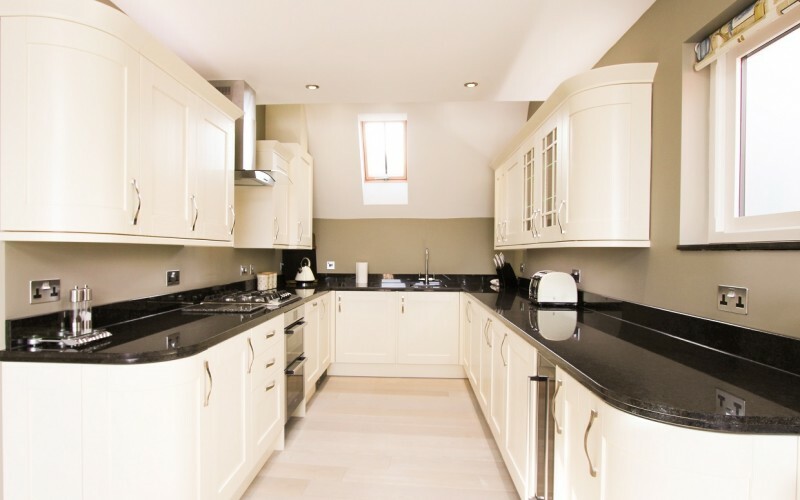 The shaker style kitchen in The Seagulls Sanctuary is very well equipped with integrated, electric fan oven, fridge, freezer, dishwasher, washer drier and all important wine cooler underneath granite worktops; on top are all of the appliances you would expect in a high end holiday let. 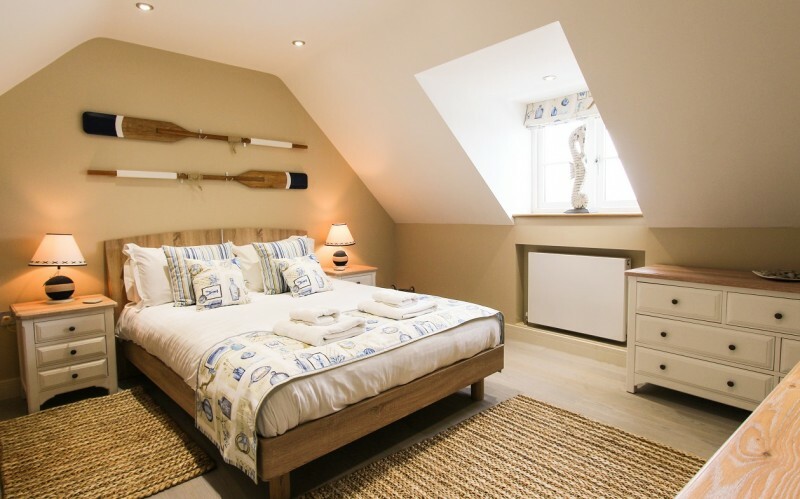 The master bedroom is again finished in a seaside theme and is a really good size. 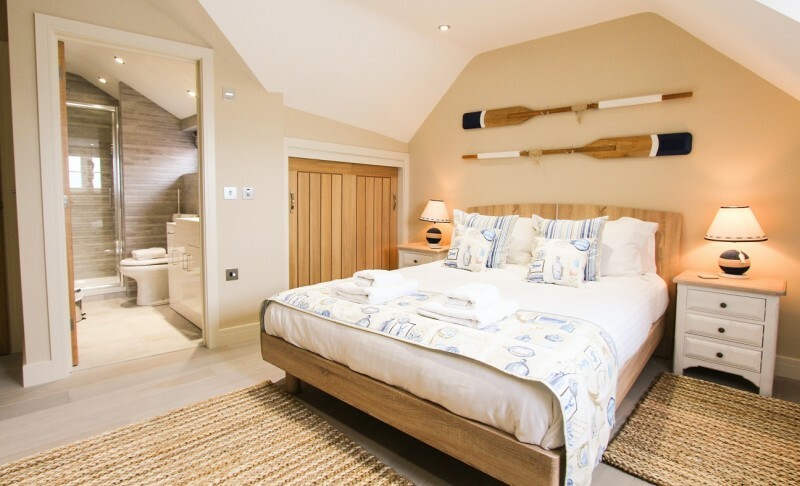 It has a king sized oak framed bed, dressing table, plenty of built in storage and more fabulous sea views from the window, it also benefits from a stylish en-suite shower room. 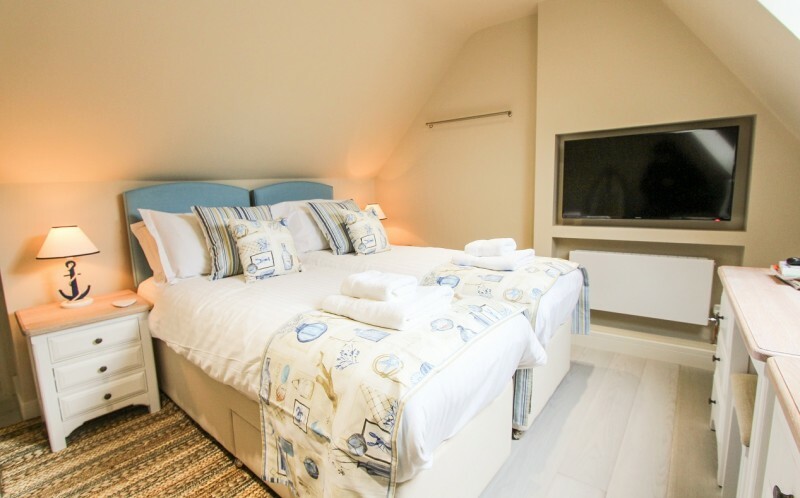 The second bedroom has a zip and link bed which can either be made up as a king or two singles (please give us at least 2 weeks notice on your choice!) 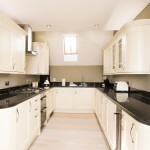 and also has plenty of storage space. 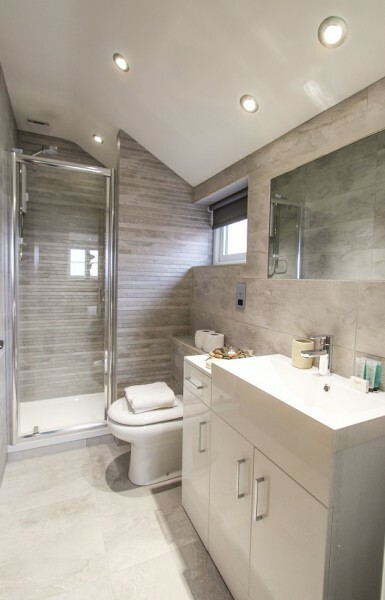 The family bathroom in The Seagulls Sanctuary is a real one off. 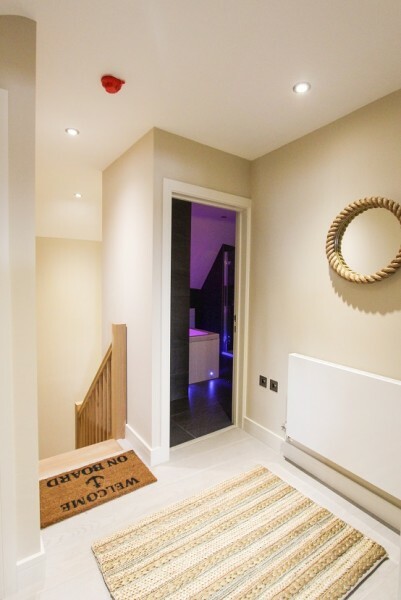 This ‘mood’ room features low level blue LED lighting, a huge Jacuzzi bath with multi-colored LED lighting and has a built in Sonos speaker… The Blakeney Cottage Company provide wine or Prosecco and chocolates as part of our welcome pack… you can probably see where we are going with this!! 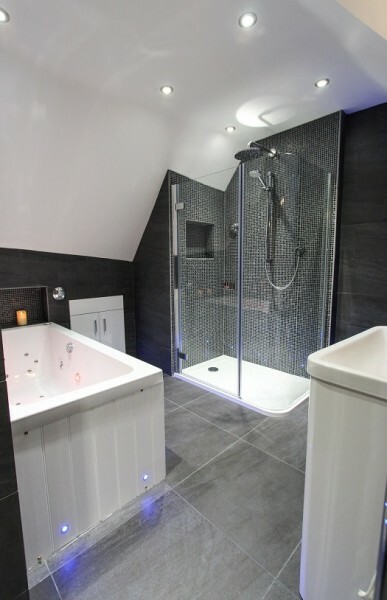 It also has a large double shower with rain shower head which is another lovely feature. 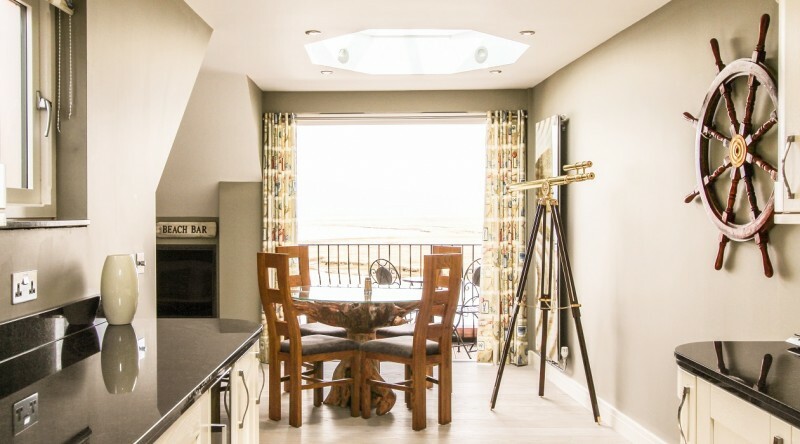 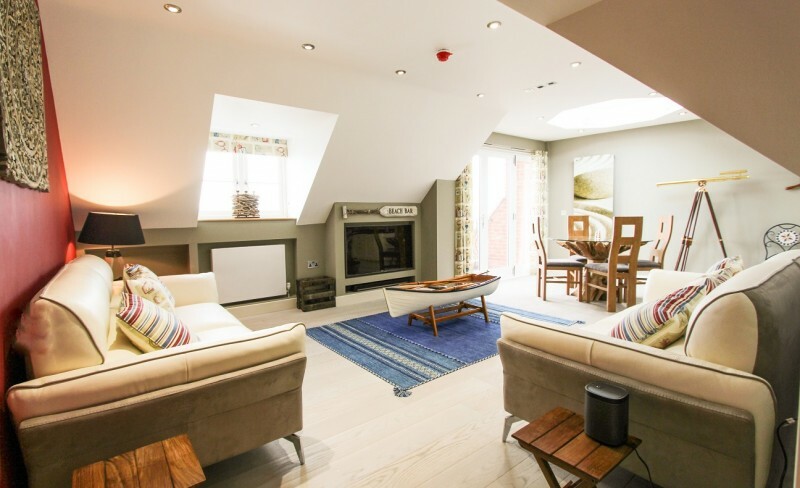 The Seagulls Sanctuary must be one of the finest luxury holiday apartments available to let on the Norfolk coast and its super location and views just add to its appeal. 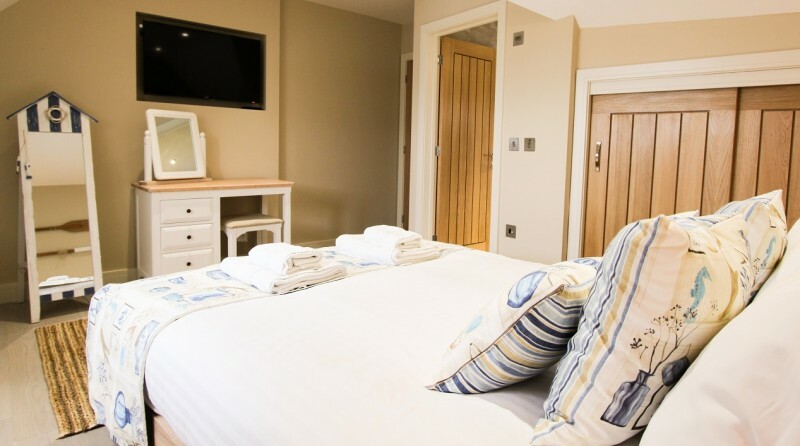 We recommend early booking to avoid disappointment!